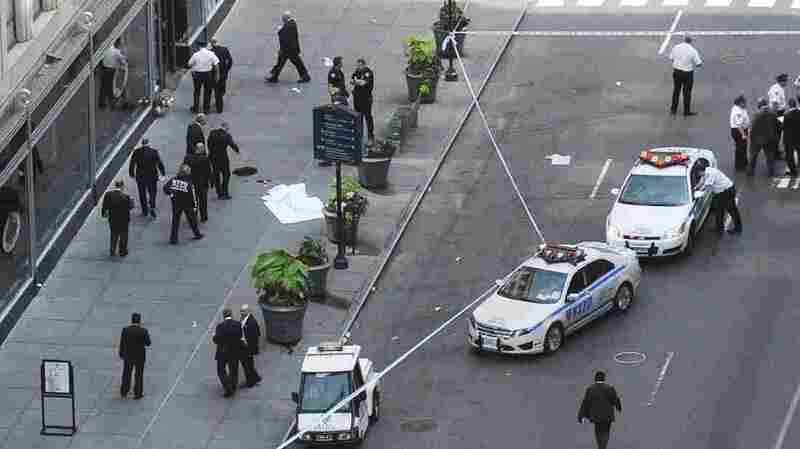 In Killing New York Gunman, Police Also Shot Bystanders : The Two-Way New York City's police commissioner, Raymond Kelly, says the nine bystanders wounded in Friday's deadly shooting of a gunman were actually struck by fragments or police bullets. The gunman was killed. Police investigate a shooting at the Empire State Building in New York on Friday. The shooting outside the Empire State Building on Friday took a new turn Saturday: New York City Police Commissioner Raymond Kelly says all nine bystanders wounded in the deadly incident were "struck either by fragments or bullets fired by the police." The incident began when Jeffrey Johnson, a disgruntled worker who'd been fired from his job last year at a clothing and accessories firm, shot and killed a former co-worker, Steven Ercolino, outside the historic building. Johnson subsequently pointed his gun at two police officers, who drew their weapons and shot him to death. But as they responded to Johnson's threat, the officers also shot other people nearby. Commissioner Kelly told CNN three people were hit by police bullets, while six others were struck by some kind of "fragment." Three victims remain hospitalized, notes CBS-New York, and they're in stable condition. New York City Mayor Michael Bloomberg said Friday everyone was expected to recover. There's been confusion about whether Johnson actually shot at the two police officers. Kelly said Saturday that investigators examined Johnson's gun, and it appears he did not shoot at the officers, according to The New York Times. Kelly says one police officer fired his gun seven times, while his partner fired nine times. The incident with police officers unfolded very quickly, according to grainy video of the scene released by the NYPD and shown here by Huffington Post. (Warning: this video is extremely graphic). From the time the armed Johnson actually confronted the officers until he was shot and fell to the ground, fewer than 10 seconds elapsed. The police department says it is investigating the incident, according to CNN.